Have you decorated for Christmas? I'm on my fourth day on almost non-stop decorating. Happily, I'm nearing the finish line. Welcome to the Creating a Cozy Christmas Blog Hop. I'm thrilled that you are here. Once you finish with this post, head on over to visit Cindy at County Road 407. She is and amazing decorator and crafter. There are 9 other talented bloggers participating in this hop. They will be listed at the end of this post. You will not want to miss a single stop. If you get lost at any time during the hop, come back here to get back on track. 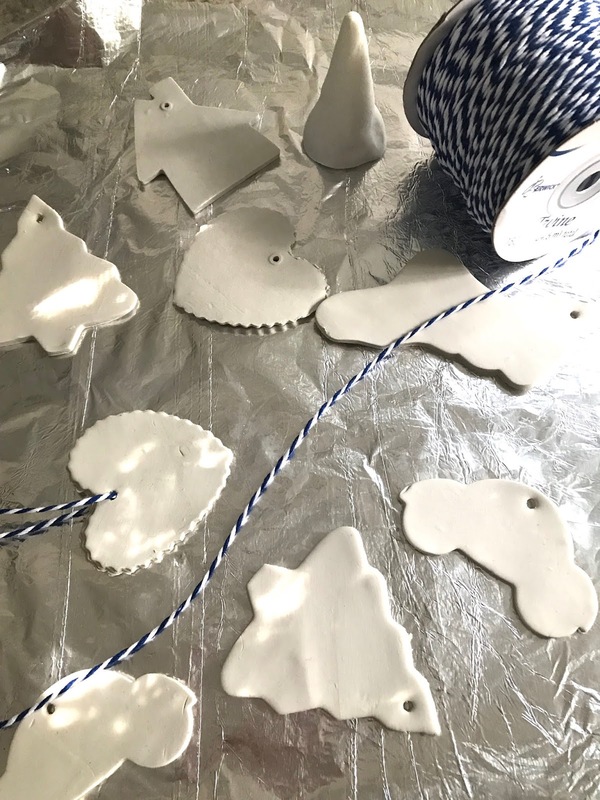 As I've been reading and preparing for our 2018 Christmas decor, simple Scandinavian elements have caught my eye. Collecting things with that theme has been fun this fall. Re-purposed, re-made or created has been my focus. Shopping retail has taken a back burner to thrifting and crafting. 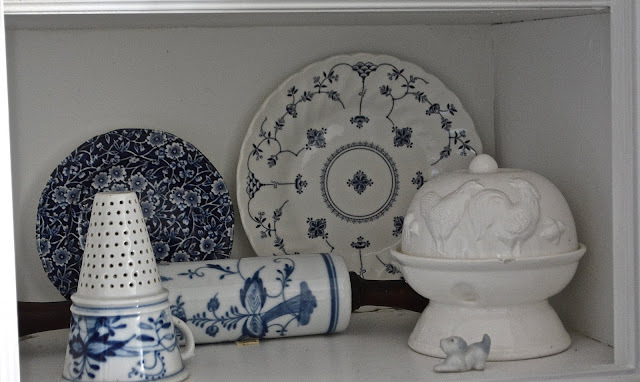 Blue and white porcelain ornaments caught my eye during a Pinterest session. I searched a few of my local stores but they didn't have what I was looking for. The #1 Christmas store in the state of Texas had one blue poinsettia choice. That was it. No blue ornaments, no blue berry picks, no stockings, no ribbons. I'm sure I'm not the only one craving a blue Christmas. 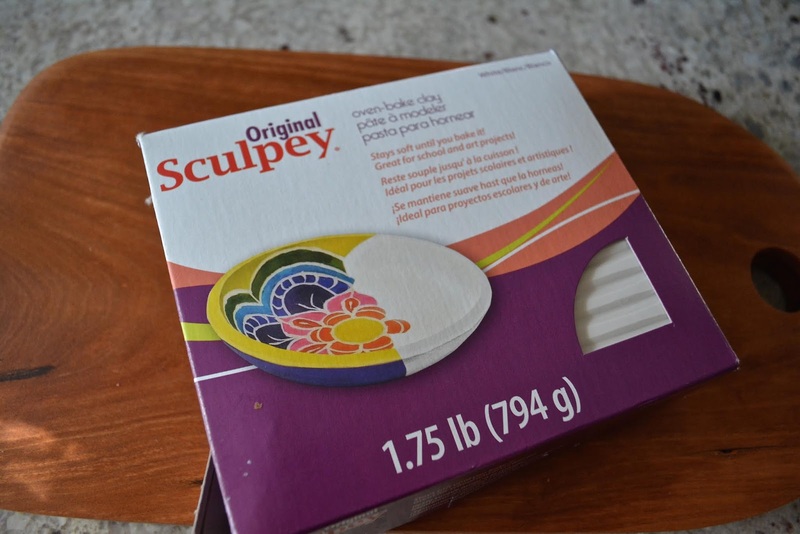 In October, I discovered Sculpey clay. My daughter created with it all the time but it wasn't something in my craft repertoire. To my delight, it can be painted. 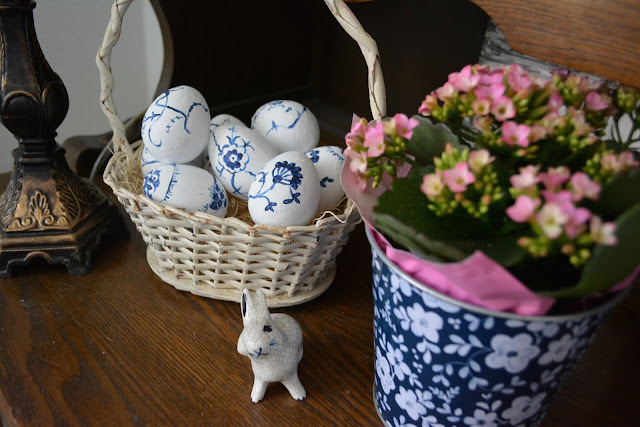 You may remember my Easter eggs painted in a straw flower or blue onion technique. That is what I had in mind for some Christmas ornaments. 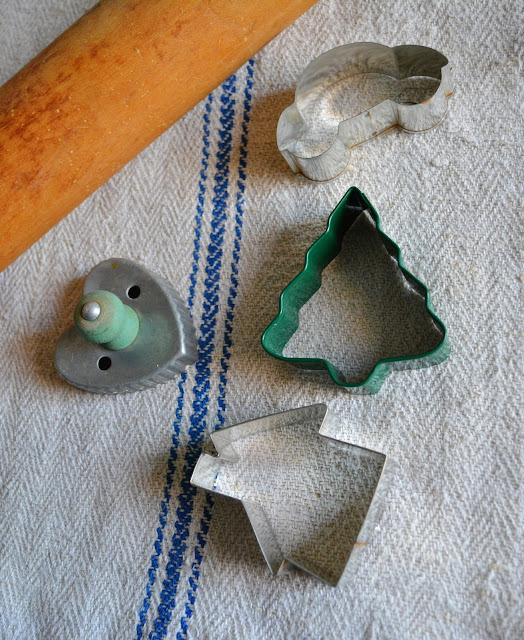 While the oven was preheating to 275 degrees, I softened the clay by rolling it around in my hands. It was flattened and rolled with a rolling pin once it was nice and soft. Shapes were cut using selections from my cookie cutter collection. Then they were placed on a foil lined cookie sheet. I made a hole in the clay with a shish kabob skewer. The clay needs to be baked for 15 minutes for every 1/4 inch of thickness. The gnome required a little bit more time because it was so thick. Once they were cooled, I threaded blue and white baker's twine through the hole. Several pieces of my porcelain collection were pulled off of the shelf for design inspiration. Tiny tipped paint brushes are essential in order to achieve success. Tooth picks were employed for even finer detail. I love them on our tree which I've named Homespun Glam. I'll post more about the tree at a later date. That is it for me. Please be sure to visit all my friends. I hope we inspire you to do a little cozy, Christmas crafting. Thank you so much for hosting our Creating a Cozy Christmas tour today! I am honored to be on it with so many talented people. I love your blue tree!!! I haven't yet tried sculpy clay. I need to get on board. Your ornaments are darling! Love the tree too. Thank you for organzing the tour. Happy Tuesday! Oh Katie, your ornaments turned you so cute! You are a talented painter, and your tree looks so pretty. I wish I would've joined in on the blog hop. I wans't sure if I could get things together. Katie, those are too cute! 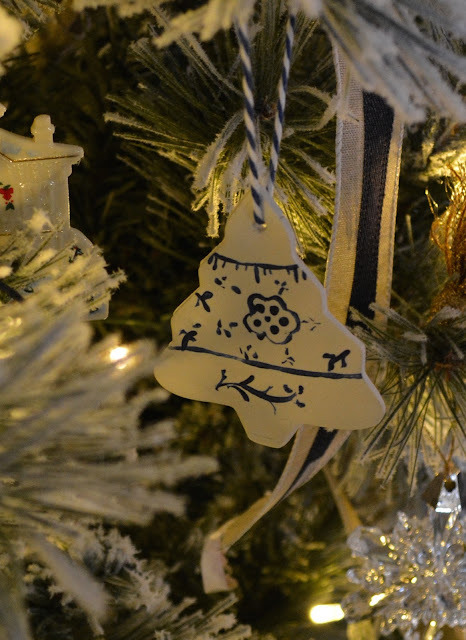 I love your ornaments and you did such a great job on painting them! I change my colors for Christmas each year and you are so right, it is difficult to find blue! Elvis sang about a "Blue Christmas" and they play the song constantly...you would think retailers would join in! :-) Thank you so much for hosting this blog hop! Hugs!! Katie, that clay is so cool. Your sweet ornaments reminded me that I used to have several Scandinavian looking ones, but I don't know what happened to them. I love the blue and white theme and your artwork is really good. 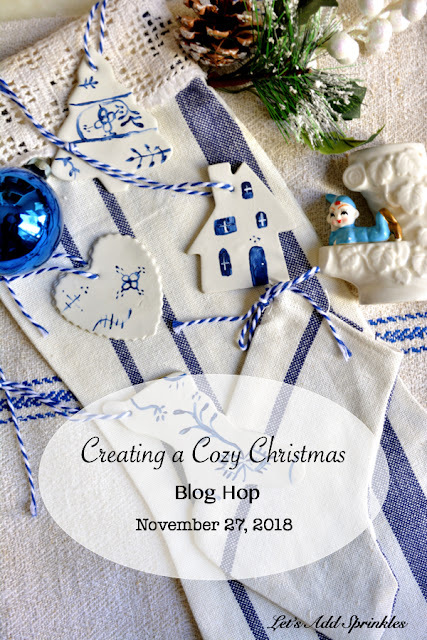 Thanks so much for organizing the Cozy Christmas Blog Hop. Katie, these ornaments are real charmers. 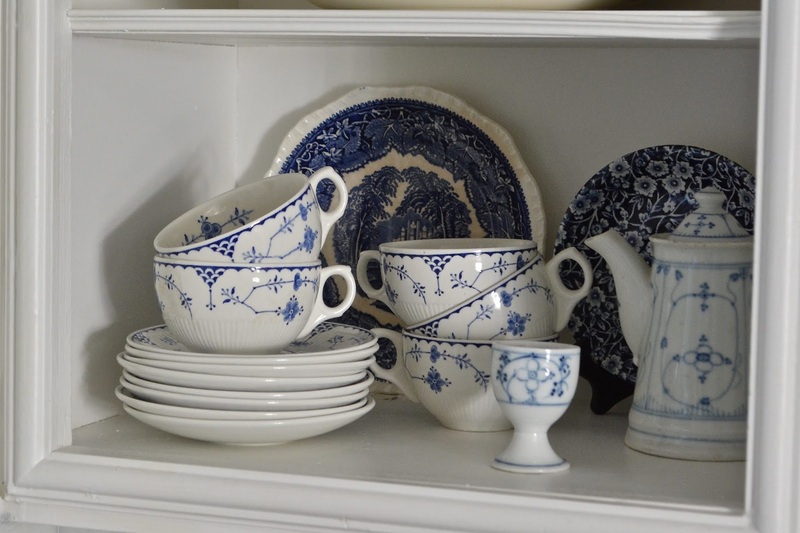 I love the idea of blue and white at Christmas. You were clever to think of making these, and your painting is perfectly beautiful. Your Homespun Glam tree is truly glamorous! Thanks for organizing the hop. Merry, Merry! You are so clever! 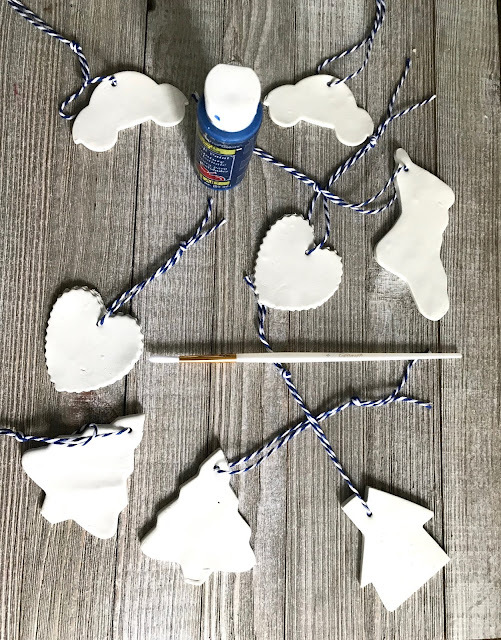 I would never have thought to make those adorable ornaments. I am definitely trying that. And your tree is beautiful. I especially love how you wrapped your ribbon. I stink at that. Katie, your ornaments are just lovely and really complement your decor. I'm not familiar with that product, but I'll have to check it out. Happy to be joining you on the hop and hope you have a blessed Christmas season! Wow! 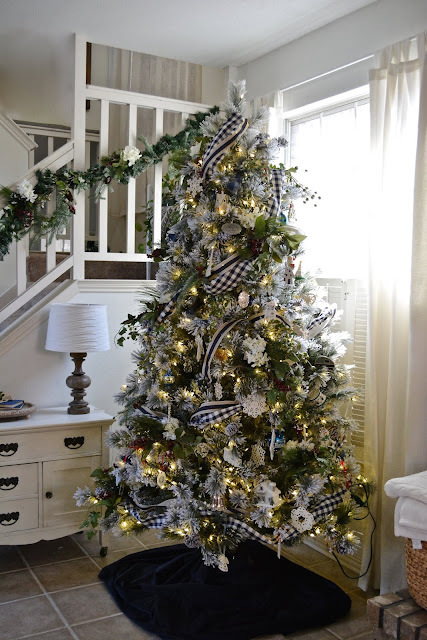 What a great idea and your tree with all the trimmings is gorgeous!! Hopped over from bj’s Sweet Nothings! I was shopping next to a lady yesterday who wanted to buy matching Christmas ornaments for her 14 grandchildren. I wish I had seen this before that conversation. She could even have personalized with names or initials. Very pretty! I am sooo in love with these You did such a fantastic job. Gosh, this hop is so much fun...hope we can do it again soon. 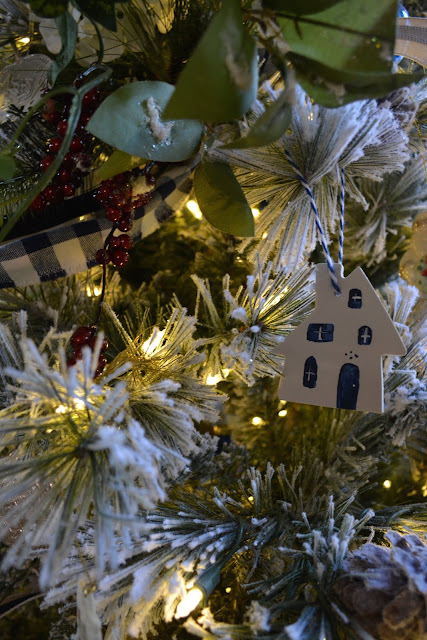 Love your tree and decorations. 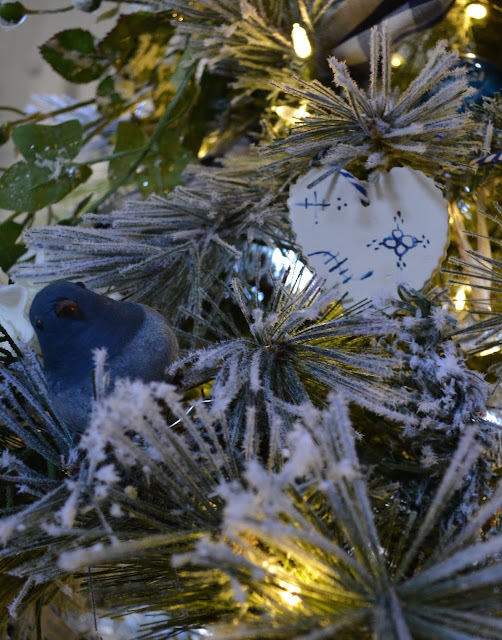 Your tree is and ornaments are absolutely amazing! I am also drawn to the Scandinavian Christmas decor, and especially winter decor. I just love what you have created! Thank you so much for including me in this fun hop! Merry Christmas season! *Your tree is stunning and your ornaments are absolutely amazing. What kind of paint did you use ? Did you bake them again after painting ? I love them and you are certainly more of an artist than me. That is an awesome tree. They are darling Katie! You did a great job!! I love sculpey clay. absolutely adorable, and these can be used with so many different themes! Pinned! Christmas time gives you a cluster of subjects to go up against as a blogger. You have the adjustment in the climate and all the Christmas exercises that individuals will be keen on finding out about. Excellent article for the Christmas, Really amazing. I appreciate it.